Vladimir Isaychev (Katusha) was the strongest rider in the day-long breakaway on stage five of the Tour de Suisse, between Trimbach-Olten and Gansingen, as the big names of the peloton decided to take the day off. The 25-year-old Russian outsprinted five other fugitives at the end of the 192.7km, to take his first ever professional victory, as heavy rain fell on the race once again. Ruben Perez (Euskaltel-Euskadi) finished in second place, pulling slightly alongside the celebrating Russian on the line, with Italian neo-pro Salvatore Puccio (Team Sky) in third. The three riders had been part of a seven-man break, which escaped after just 11km, along with Daniel Oss (Liquigas-Cannondale), Karsten Kroon (Saxo Bank), Klaas Lodewyck (BMC Racing) and Sébastien Minard (AG2R La Mondiale). The peloton completely shut down, as the heavy rain fell, and allowed the break’s lead to open up to beyond ten minutes and, as they entered the final phase of the stage, it became obvious that the winner would come from the leading seven. Lodewyck was the first to make his move, launching an attack with 22km to go, but he was caught shortly afterwards on the climb of the Kaistenberg with around 17km to go. This was the end of the Belgian’s chances, as he was left behind on the 3rd category slopes and, despite several attacks in the closing kilometres, the six remaining riders were together as they arrived at the finish. Isaychev hit the front first, with 250 metres to go, and the others could do nothing to stop him. Despite the cat-and-mouse games played by the breakaway riders in the closing kilometres, the relaxed speed of the peloton saw the gap continue to grow. Lodewyck crossed the line in seventh place, 1’50” back, but it wasn’t until 11’07” later that Elia Viviani (Liquigas-Cannondale) won the bunch sprint for eighth. Despite the breakaway riders gaining eleven minutes on race leader Rui Costa (Movistar), which lifted best placed rider Puccio into the top-30 overall, there were no changes to the overall classification, with the Portuguese rider holding onto the yellow jersey once more. Stage five was not dissimilar in appearance to the two preceding stages, as the race headed further north to the Rhine, and Switzerland’s border with Germany. Peppered with 3rd category climbs, the course was tailor made for breakaways and, like the two previous stages, included a 40.9km finishing circuit - that included the climbs of the Bürersteig and Kaistenberg - which would be completed twice. With the seventh stage time trial, and the mountains of stages eight and nine on the horizon, and with heavy rain falling on the race yet again, the big names of the peloton were resolved to have as easy a day as possible, and were to allow a breakaway to go completely unchallenged. After some initial, unsuccessful, attempts to breakaway - one of which involved sprinters Tom Boonen (Omega Pharma-Quick Step) and Elia Viviani (Liquigas-Cannondale) - Oss and Kroon escaped at the ten kilometre point. Puccio, Lodewyck, Perez and Minard quickly chased up to the two leaders, with Isaychev joining soon afterwards and, with nobody of any immediate threat to Costa’s lead, they were allowed to go. Puccio was the best placed of the septet, but was 13’12” down, in 74th place. 50km into the stage, the break was up to over eight minutes; it fell slightly in the following kilometres but, as they crossed the 3rd category Staffelegg and Benkerjoch climbs, it began to grow again and, as they entered the final 80km of the stage, it ticked over the ten minute mark. More by chance than by design, the Movistar team reduced the gap to less than nine and a half minutes in the following kilometres but, with 55km to go, it went back over ten minutes. The weather began to improve and, as the seven leaders climbed the Kaistenberg for the second time with 56.3km to go, the peloton was 10’10” as it rolled slowly over the top. Once again, the steady tempo set by Movistar meant that it gradually dropped below the ten minute mark again, but with 40km to go the rain began to fall again. All seven riders were continuing to work together, but turns were now getting a little shorter as they began to think about the finale. With 22km to go, and with the lead at 9’12”, the attacks began as Lodewyck jumped away. The initial response was slow, as the other six continued with their pace line, but this meant that the Belgian was only able to get a few seconds clear on the long, straight road. Across the intermediate sprint line in Frick, with 18.5km to go, Lodewyk was only a few seconds clear, but the co-operation was beginning to end in the chase group. As they hit the foot of the Kaistenberg shortly afterwards, Isaychev jumped away in pursuit. The Russian caught and passed Lodewyck on the way up and, as he crossed the line first, took the lead in the mountains competition. The five others were right behind him however - with Lodewyck the only one to be left behind - and on the gentle descent that followed, Perez launched his own attack. Isaychev powered across the gap though, and the others followed close behind; the Basque tried again with 12km to go, but the others reeled him in gradually, and caught him again shortly after the ten kilometre banner. Lodewyck was now somewhere behind the leading six, while the peloton, having closed to within eight and a half minutes, was now more than nine behind. With Perez caught, the attacks began again, with Oss and Kroon both making half-hearted solo moves. With seven to go though, despite his path being momentarily blocked by a race moto, Kroon went again; Isaychev and Perez managed to fight across to him by the six kilometre banner, while Puccio and Minard forced Oss - arguably the fastest sprinter - to close the gap for them. They were six riders once more as they passed under the five kilometre banner, and began to spread across the road as they watched one another for the next attack. It came from Minard, but it was expected, and the Frenchman didn’t get far. Inside four to go though, the Frenchman drifted across the road and accelerated; Isaychev was the strongest once more however, and quickly pulled the rest across. Despite the track-style cat-and-mouse racing, Lodewyck had still not caught up with his former companions, and the gap to the peloton was stretching to ten and a half minutes as they approached the final two kilometres. Minard tried again, but Oss was right on him but, as the group slowed down he went again. This time the Frenchman had opened up a gap, but Perez pulled Oss across, which saw the other three left behind. Under the flamme rouge there were two groups of three, but Isaychev was doing his utmost to close it down again; Puccio finished the job, and they were back together with 500 metres left. Isaychev launched himself with 250 metres to go and, as the others lined up behind him, nobody had the strength to come past him. Perez almost pulled alongside as the Russian freewheeled across the line, punching the air with his right fist as he went. Lodewyck rolled slowly over the line 1’50” later and, as several riders tried to jump off the front of the peloton in the final kilometres, Viviani outsprinted Kris Boeckmans (Vacansoleil-DCM) after 11’07”. Despite getting another soaking, Costa passed an uneventful day in yellow, and carried his eight second lead over Fränk Schleck (RadioShack-Leopard) into the sixth stage. ESP 2 Ruben Perez Moreno (Euskaltel - Euskadi) s.t. ITA 3 Salvatore Puccio (Sky Procycling) s.t. NED 4 Karsten Kroon (Team Saxo Bank) s.t. FRA 5 Sébastien Minard (Ag2R - La Mondiale) s.t. BEL 9 Kris Boeckmans (Vacansoleil - DCM Pro Cycling Team) s.t. ITA 10 Alessandro Bazzana (Team Type 1 - SANOFI) s.t. GER 11 Fabian Wegmann (Garmin - Barracuda) s.t. FRA 12 Lloyd Mondory (Ag2R - La Mondiale) s.t. NED 13 Tom Jelte Slagter (Rabobank Cycling Team) s.t. ESP 14 Jose Joaquin Rojas Gil (Movistar Team) s.t. POR 15 Rui Alberto Faria Da Costa (Movistar Team) s.t. FRA 16 Cédric Pineau (Equipe Cycliste FDJ - BigMat) s.t. LUX 17 Laurent Didier (RadioShack - Nissan) s.t. FRA 18 Thibaut Pinot (Equipe Cycliste FDJ - BigMat) s.t. SUI 19 Martin Kohler (BMC Racing Team) s.t. USA 20 Edward King (Liquigas - Cannondale) s.t. SUI 21 Martin Elmiger (Ag2R - La Mondiale) s.t. ITA 22 Jacopo Guarnieri (Astana Pro Team) s.t. BEL 23 Frederique Robert (Lotto - Belisol Team) s.t. SUI 24 Gregory Rast (RadioShack - Nissan) s.t. IRI 25 Mehdi Sohrabi (Lotto - Belisol Team) s.t. IRL 26 Nicolas Roche (Ag2R - La Mondiale) s.t. NED 27 Wout Poels (Vacansoleil - DCM Pro Cycling Team) s.t. RUS 28 Alexander Efimkin (Team Type 1 - SANOFI) s.t. SUI 29 Rubens Bertogliati (Team Type 1 - SANOFI) s.t. AUS 30 Allan Davis (Orica - GreenEDGE) s.t. CAN 31 Ryan Anderson (Spidertech Powered By C10) s.t. BEL 32 Maxime Monfort (RadioShack - Nissan) s.t. LUX 33 Frank Schleck (RadioShack - Nissan) s.t. CAN 34 Guillaume Boivin (Spidertech Powered By C10) s.t. USA 35 Thomas Danielson (Garmin - Barracuda) s.t. GER 36 Linus Gerdemann (RadioShack - Nissan) s.t. FRA 37 Julien El Fares (Team Type 1 - SANOFI) s.t. ITA 38 Stefano Agostini (Liquigas - Cannondale) s.t. NED 39 Robert Gesink (Rabobank Cycling Team) s.t. AUT 40 Georg Preidler (Team Type 1 - SANOFI) s.t. ESP 41 Mikel Astarloza (Euskaltel - Euskadi) s.t. DEN 42 Chris Anker Sorensen (Team Saxo Bank) s.t. POR 43 Sergio Miguel Moreira Paulinho (Team Saxo Bank) s.t. ESP 44 Gorka Izagirre Insausti (Euskaltel - Euskadi) s.t. ITA 46 Alessandro Petacchi (Lampre - ISD) s.t. USA 47 Levi Leipheimer (Omega Pharma - Quickstep) s.t. ESP 48 Alejandro Valverde Belmonte (Movistar Team) s.t. 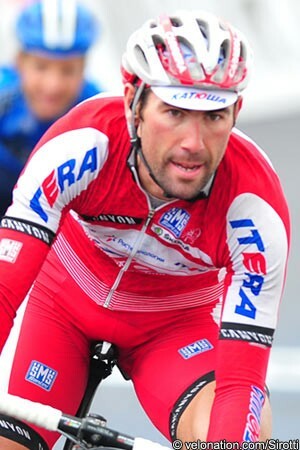 ITA 49 Giampaolo Caruso (Katusha Team) s.t. ITA 50 Francesco Gavazzi (Astana Pro Team) s.t. NED 51 Steven Kruijswijk (Rabobank Cycling Team) s.t. FRA 52 David Boucher (Equipe Cycliste FDJ - BigMat) s.t. ESP 53 José Ivan Gutierrez Palacios (Movistar Team) s.t. NED 54 Laurens Ten Dam (Rabobank Cycling Team) s.t. ESP 55 Mikel Nieve Ituralde (Euskaltel - Euskadi) s.t. CZE 56 Roman Kreuziger (Astana Pro Team) s.t. ITA 57 Damiano Cunego (Lampre - ISD) s.t. BLR 58 Yauheni Hutarovich (Equipe Cycliste FDJ - BigMat) s.t. RUS 59 Vladimir Karpets (Movistar Team) s.t. BEL 60 Maarten Wynants (Rabobank Cycling Team) s.t. GER 61 Danilo Hondo (Lampre - ISD) s.t. SVK 62 Peter Sagan (Liquigas - Cannondale) s.t. ITA 63 Morris Possoni (Lampre - ISD) s.t. DEN 64 Jakob Fuglsang (RadioShack - Nissan) s.t. GER 65 Grischa Niermann (Rabobank Cycling Team) s.t. FRA 66 Romain Sicard (Euskaltel - Euskadi) s.t. ESP 67 Vicente Reynes Mimo (Lotto - Belisol Team) s.t. RUS 68 Alexandr Kolobnev (Katusha Team) s.t. ITA 69 Moreno Moser (Liquigas - Cannondale) s.t. SUI 70 Mathias Frank (BMC Racing Team) s.t. DEN 71 Troels Ronning Vinther (Team Saxo Bank) s.t. RUS 72 Nikita Novikov (Vacansoleil - DCM Pro Cycling Team) s.t. SUI 73 Michael Albasini (Orica - GreenEDGE) s.t. FRA 74 William Bonnet (Equipe Cycliste FDJ - BigMat) s.t. FRA 75 Anthony Geslin (Equipe Cycliste FDJ - BigMat) s.t. ITA 76 Dario Cataldo (Omega Pharma - Quickstep) s.t. UKR 77 Volodymyr Gustov (Team Saxo Bank) s.t. FRA 78 John Gadret (Ag2R - La Mondiale) s.t. BEL 79 Bart De Clercq (Lotto - Belisol Team) s.t. BEL 80 Olivier Kaisen (Lotto - Belisol Team) s.t. EST 81 Tanel Kangert (Astana Pro Team) s.t. FRA 82 Julien Berard (Ag2R - La Mondiale) s.t. CAN 83 Michael Barry (Sky Procycling) s.t. FRA 84 Guillaume Bonnafond (Ag2R - La Mondiale) s.t. AUS 86 Mathew Hayman (Sky Procycling) s.t. GBR 87 Ben Swift (Sky Procycling) s.t. SWE 88 Thomas Löfkvist (Sky Procycling) s.t. ITA 89 Davide Vigano (Lampre - ISD) s.t. FRA 90 Jérémy Roy (Equipe Cycliste FDJ - BigMat) s.t. FRA 91 Steve Chainel (Equipe Cycliste FDJ - BigMat) s.t. SLO 92 Grega Bole (Lampre - ISD) s.t. FRA 93 Remi Cusin (Team Type 1 - SANOFI) s.t. DEN 94 Brian Vandborg (Spidertech Powered By C10) s.t. USA 95 Caleb Fairly (Spidertech Powered By C10) s.t. USA 96 Tyler Farrar (Garmin - Barracuda) s.t. RUS 97 Vladimir Gusev (Katusha Team) s.t. NED 98 Johnny Hoogerland (Vacansoleil - DCM Pro Cycling Team) s.t. ITA 99 Matteo Trentin (Omega Pharma - Quickstep) s.t. GBR 101 Luke Rowe (Sky Procycling) s.t. NED 102 Niki Terpstra (Omega Pharma - Quickstep) s.t. ITA 103 Leonardo Bertagnolli (Lampre - ISD) s.t. ESP 104 Javier Mejias Leal (Team Type 1 - SANOFI) s.t. ITA 105 Daniele Colli (Team Type 1 - SANOFI) s.t. NED 106 Bauke Mollema (Rabobank Cycling Team) s.t. KAZ 107 Dmitriy Muravyev (Astana Pro Team) s.t. SVK 108 Peter Velits (Omega Pharma - Quickstep) s.t. DEN 109 Martin Mortensen (Vacansoleil - DCM Pro Cycling Team) s.t. ITA 110 Manuele Mori (Lampre - ISD) s.t. ESP 111 Xabier Zandio Echaide (Sky Procycling) s.t. ITA 112 Tiziano Dall'antonia (Liquigas - Cannondale) s.t. CZE 113 Zdenek Stybar (Omega Pharma - Quickstep) s.t. USA 114 Alex Howes (Garmin - Barracuda) s.t. USA 115 Lucas Euser (Spidertech Powered By C10) s.t. USA 116 Thomas Peterson (Garmin - Barracuda) s.t. SWE 117 Fredrik Kessiakoff (Astana Pro Team) s.t. GER 118 Marcus Burghardt (BMC Racing Team) s.t. NED 119 Thomas Dekker (Garmin - Barracuda) s.t. BEL 120 Johan Vansummeren (Garmin - Barracuda) s.t. GER 121 Andréas Klöden (RadioShack - Nissan) s.t. CRO 122 Robert Kiserlovski (Astana Pro Team) s.t. AUS 123 Baden Cooke (Orica - GreenEDGE) s.t. BEL 124 Nick Nuyens (Team Saxo Bank) s.t. USA 125 Timothy Duggan (Liquigas - Cannondale) s.t. USA 126 Brent Bookwalter (BMC Racing Team) s.t. ESP 127 Rafael Valls Ferri (Vacansoleil - DCM Pro Cycling Team) s.t. NOR 128 Lars Petter Nordhaug (Sky Procycling) s.t. BEL 129 Greg Van Avermaet (BMC Racing Team) s.t. ITA 130 Marco Marcato (Vacansoleil - DCM Pro Cycling Team) s.t. ESP 134 Joan Horrach Rippoll (Katusha Team) s.t. ESP 135 Oscar Gomez Freire (Katusha Team) s.t. BEL 136 Gert Steegmans (Omega Pharma - Quickstep) s.t. BEL 137 Tom Boonen (Omega Pharma - Quickstep) s.t. DEN 138 Matti Breschel (Rabobank Cycling Team) s.t. ITA 139 Luca Paolini (Katusha Team) s.t. SUI 140 Fabian Cancellara (RadioShack - Nissan) s.t. DEN 141 Michael Morkov (Team Saxo Bank) s.t. NED 142 Sebastian Langeveld (Orica - GreenEDGE) s.t. SUI 143 Raimond Künzli (Spidertech Powered By C10) s.t. GBR 144 Steven Cummings (BMC Racing Team) s.t. AUS 145 Cameron Meyer (Orica - GreenEDGE) s.t. KAZ 146 Assan Bazayev (Astana Pro Team) s.t. UKR 49 Volodymyr Gustov (Team Saxo Bank) s.t. ESP 51 Ruben Perez Moreno (Euskaltel - Euskadi) s.t. BEL 94 Maarten Wynants (Rabobank Cycling Team) s.t. BEL 96 Nick Nuyens (Team Saxo Bank) s.t. FRA 99 Steve Chainel (Equipe Cycliste FDJ - BigMat) s.t. USA 110 Edward King (Liquigas - Cannondale) s.t. BEL 129 Olivier Kaisen (Lotto - Belisol Team) s.t.